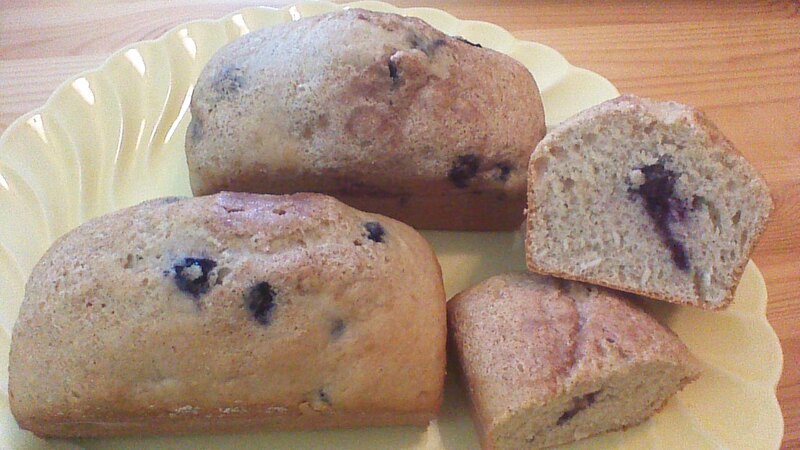 Not too sweet, Spiced Lemon Blueberry Bread is lovely enjoyed with fresh butter over afternoon tea. This recipe makes excellent use of preserved lemons (a link to that recipe is provided below). If you don’t have preserved lemons, you can mimic the flavor in this recipe by substituting 1 tablespoon lemon juice + 1 teaspoon lemon zest + 1/4 teaspoon cinnamon. Step 1) Grease loaf pan well and coat with flour. Set aside. Step 2) Combine all dry ingredients and mix well. Step 3) Combine egg, milk, and applesauce in a separate bowl and mix well. Step 4) Add wet ingredients to dry ingredients and stir until moistened. Don’t get carried away… it’s OK if the batter is a little bit lumpy! Step 5) Gently fold in blueberries. Save a dozen blueberries for the next step. Step 6) Transfer batter to loaf pan. Sprinkle top with a bit of sugar and a few extra blueberries if desired. Step 7) Bake at 350 degrees for 50 minutes or until a toothpick inserted near the center of the loaf comes out clean. Cool and enjoy! 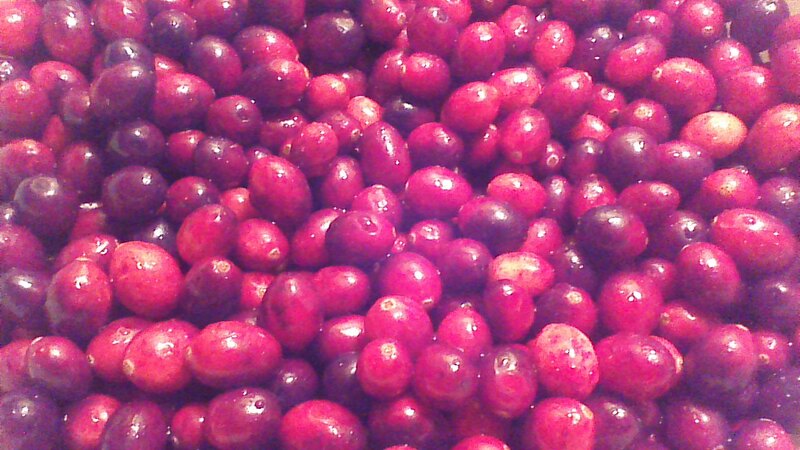 Cranberries and blueberries offer up a whole lot of nutrition in a tiny, colorful package! Both are high in fiber, high in Vitamin C, and pretty low in calories (around 50 and 80 calories per cup, respectively). This simple cobbler makes cranberries and blueberries look all fancy schmancy using ramekin dishes and a drop biscuit topping. What this recipe doesn’t offer is a lot of added sugar – only half a tablespoon her serving. 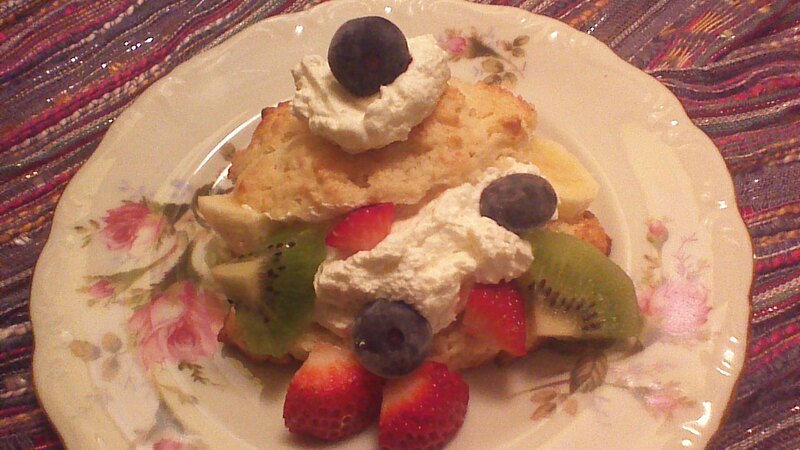 If you’re feeling rebellious, go ahead and make this dessert for breakfast. I won’t tell. Step 1) Stir together 2 tablespoons sugar, cornstarch, and water in a medium saucepan until sugar and starch are dissolved. 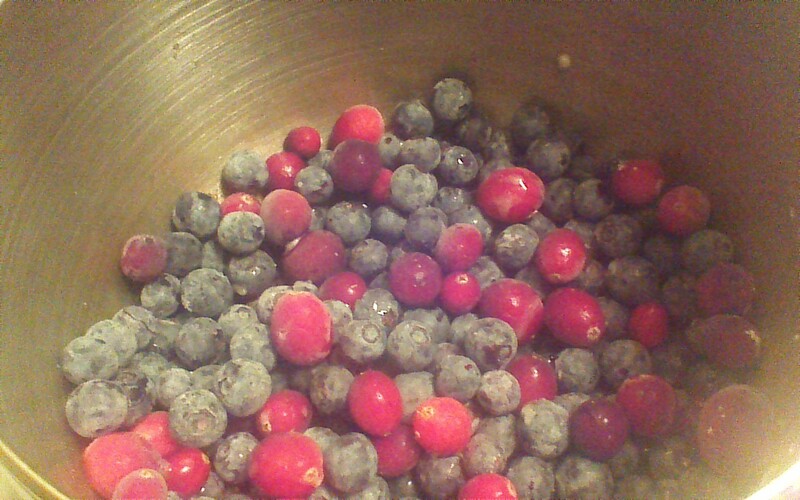 Step 2) Add blueberries and cranberries. Simmer over medium heat, stirring occasionally, until mixture is thick and bubbly. Step 3) Carefully ladle fruit mixture into greased ramekin dishes. Alternatively, you could use one large pie dish. Step 4) Combine flour, 1 tablespoon sugar, and baking powder in a small bowl. “Cut in” butter using a pastry cutter or two forks. When you are finished, the butter should be in very tiny pieces, evenly distributed through the flour mixture. Step 5) Add almond extract, lightly beaten egg, and milk to the flour and butter mixture. Stir until just combined. Step 6) Drop approximately 1 tablespoonful of biscuit mixture on top of each ramekin. 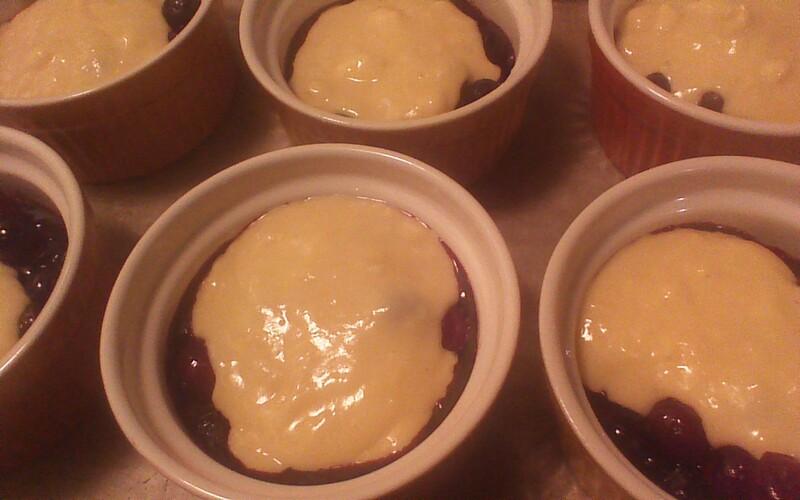 Step 7) Bake ramekins in preheated 400 degree oven for 20 minutes. 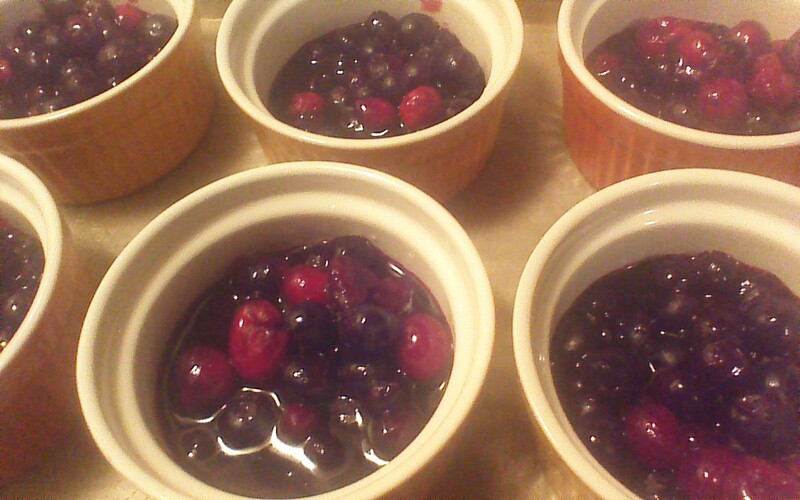 I find it convenient to place all 6 ramekins in a 9×13 cake pan, for easy insertion and removal from oven. Step 8) Let cool for a few minutes, and enjoy! I can’t think of a breakfast more devoted to overall wellness than a bowl of properly dressed oatmeal. I really can’t. For only 150 calories, a single cup of oats contains about 6 grams of protein and 4 grams of fiber. 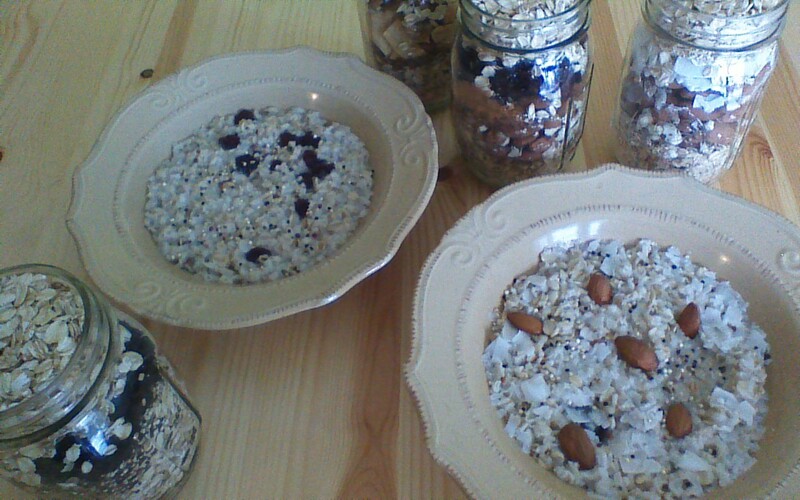 The soluble fiber in oats, called beta-glucan, is special. This fiber has repeatedly been shown to lower cholesterol levels, which in turn lowers the risk of developing cardiovascular disease. Still not convinced? What if I tell you that the beta-glucan in oats has also been linked to more stable blood sugar levels in people with Type 2 diabetes? It’s true. 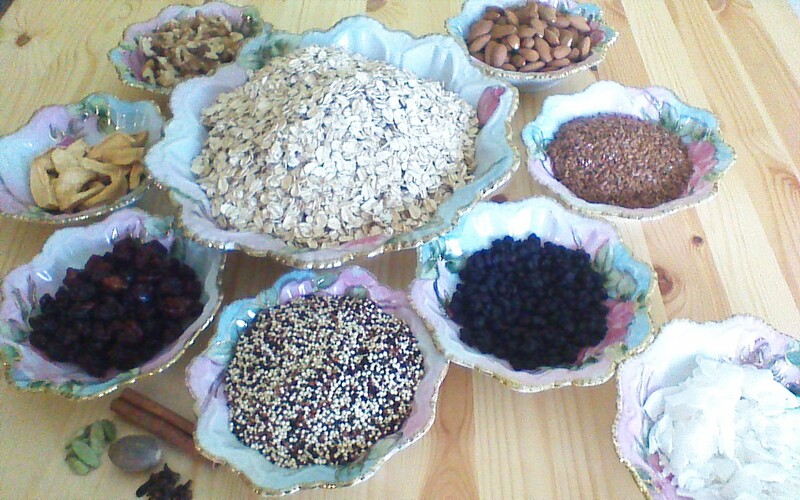 How much of this special fiber does it take to improve your health, you ask? Only the amount found in a daily bowl of oatmeal. So, let’s do ourselves a favor this morning. Let’s both agree to say “No” to preservative-laden boxed cereals, skip the donuts with our coffee, and instead enjoy properly dressed bowls of oatmeal together. Stir together the ingredients for the blend of your choice, below, in a small mixing bowl. Pack into a pint size mason jar. For each serving, scoop out 1/2 cup of mixture from the mason jar and place in a microwave-safe bowl. Add 1 cup of water and microwave for 2 minutes or until water is absorbed. Enjoy!